What's New for the 2019 Buick Envision? 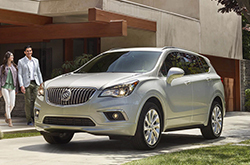 With a more refined exterior, a refreshed interior, and a new choice of exterior paint, the 2019 Envision gets a standing ovation from Buick fans. This year, this trusty SUV gets styling tweaks with a new triangular grille shape and an attractive fascia with chrome-ringed fog lights. Some previously optional features, like HID headlights, are now standard on the Envision. So are LED headlights, which along with brighter tail lights, reflectors, and side lamps, make the car more visible than in past years. 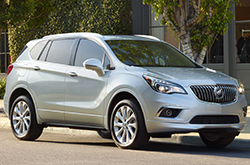 Also for this year, customers can order the Envision in an elegant Satin Steel exterior. Inside, customers can manually turn off the automatic start/stop device, which is a seemingly minor change, but nonetheless important. The 2019 Envision has faster and warmer seat heaters than previous models, and customers can choose to order seats in a dark gray leather color. The 2019 Envision also has a sportier feel on the road, thanks to a nine-speed transmission system, available on select models, that allows the engine to generate more torque. Which Trims and Tech Features Are Available? There are three trim levels in the 2019 Envision family, which are the base model, the Preferred, and the Essence. The base model has a number of notable standard features, including a sliding and reclining second row of seats and a push-button start. Also standard on the base model is a backup camera and remote-operated power liftgate. Backing up is simplified with rear parking assistance, which is made even easier with a backup camera that has a sharper lens. The driver's seat and front passenger seats are heated in the base model, too. Both front row seats also have an eight-way power-operated memory system. The dashboard features a 4.2-inch driver display screen and an eight-inch infotainment touchscreen. Moving up to the Preferred, one gets these features and more. Split-folding and reclining back seats are standard on the mid-level SUV. The Preferred also has active noise cancellation and a six-speaker audio system. The Preferred also has a connectivity package that makes it easy to enjoy apps on the road. WiFi, USB ports, and cruise control are other standard highlights of the Preferred. The top-level trim, which is the Essence, has more features. All passengers can ride in comfort with a three-zone climate control. Rear cross-traffic alert is also a standard feature in the Essence, as are heated outboard seats and a heated steering wheel. An eight-inch infotainment screen is standard, and customers can choose to upgrade to an eight-inch infotainment screen with navigation. 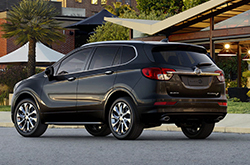 The Buick Envision is powered by a turbocharged 2.0L, four-cylinder engine that produces 252 HP and 295 LB-FT of torque. All trim levels also come with four-wheel antilock disc brakes. A six-speed automatic transmission is also standard. Drivers of the Essence can also choose to upgrade to a nine-speed automatic transmission. The 2019 Envision also comes standard with an electronic stability control system, a MacPherson front suspension, and a four-link suspension system in the back. Front-wheel drive is standard on all trim levels. The Envision is equipped with a lengthy list of safety features for a better driving experience. A total of 10 airbags protects the driver and passengers in the event of a crash. The airbag system also has a passenger detection feature. Child safety locks are standard on the back doors, and LED daytime running lamps are also standard. The Envision has a lane change alert and side blind zone alert too. A tire pressure monitoring system is another standard feature, and it's paired with a tire fill alert sensor that lets drivers know when a low tire has been filled to capacity. The horn has a dual-tone setting for safety, and the vehicle comes with stability traction control for driving in adverse weather conditions. 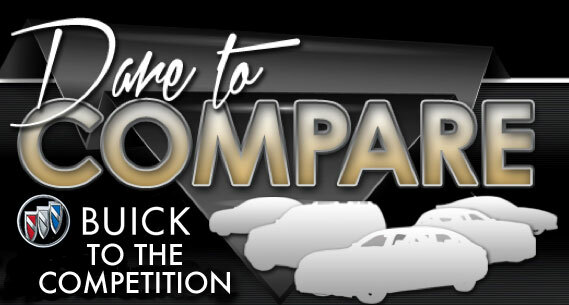 Come see why the 2019 Buick Envision is the best Envision that Buick has produced. We are also happy to answer any questions you might have.